Prints - Kates Nature Photography, Inc.
Fine art photography begins with the artist/photographer. All the printing technology available cannot make up for a poor photograph. But if that photograph is to make it's way to print, you must have professional equipment. Recently we invested in new printing technology which enables us to create our own prints in-house, but to standards previously only produced by fine art print shops. The wide variety of inks and papers available to us today allows us to create prints of unprecedented longevity - much greater than traditional photographic print techniques. All prints are signed and available in editions of 100. They come with a certificate of authenticity with details of the print and the edition number. You'll hear the term Giclée printing used interchangeably with ink-jet printing. It's a term used to describe the method of laying down ink on paper to create a photograph. Giclée is an advanced digital printmaking technology involving archival quality inks that are finely jet streamed onto fine archival papers. Giclée printing provides superior color accuracy and incredible detail over other modes of reproduction. The quality that's available now is far superior to anything we've been able to produce in the past. At the core of this new technology is the ink set we use in our large format professional printers. It is an 11 color ink (including a photo black and a matte black) set that is made with pigments rather than dyes. The advantage of pigment ink is that it's very stable and less prone to fading than the typical dye-based inks found in consumer quality ink-jet printers. A whole new technology of printer equipment needed to develop to take advantage of these inks. Not only are the colors richer and brighter than ever before, but the new set includes varying shades of black to create incredibly rich detail in black & white photography. These new inks will allow you to enjoy your artwork for decades and generations. The paper selection available for Fine Art Printing, especially of photography, has never been better. We have at our disposal a variety of fine art papers that re 100% archival in nature such as Epson's Cold Press Paper. It has a textured matte finish that is 100% cotton fibre, pH buffered and acid free for incredible longevity. Up until now, matte papers didn't have the vibrance that more traditional types of glossy papers had to reproduce the subtle changes of color in photographs. The ability for this paper to get a deep, rich black is unmatched by anything in the past. And the natural white tone of the paper is pleasing for many styles of photography, including landscapes, portraiture, and beautiful, slightly warm-tone Black & Whites. We also use Moab's Slickrock Metallic Pearl. This paper produces incredible images that appear to take on a life of their own. Of course there are other papers available and we use them for certain prints. Among them is Epson's Hot Press Natural, which has the same characteristics as the Cold Press, but with a very smooth, rather than textured, finish, as well as the new Exhibition Matte Canvas Natural and a range of papers and canvas by Hahnemühle, the 425 year old paper company from Germany, Brilliant, & Moab. We use some of these exotic rag and other papers to create the ultimate in unique artwork. Nature prints on canvas offer a unique, gallery-like presentation that are suitable for any decor. The photograph is printed on a fine art canvas, coated with a protective coat of varnish, and stretched onto a wooden frame. Because this is the same method used in creating a painter's canvas, these photographs are often mistaken for paintings in this form. 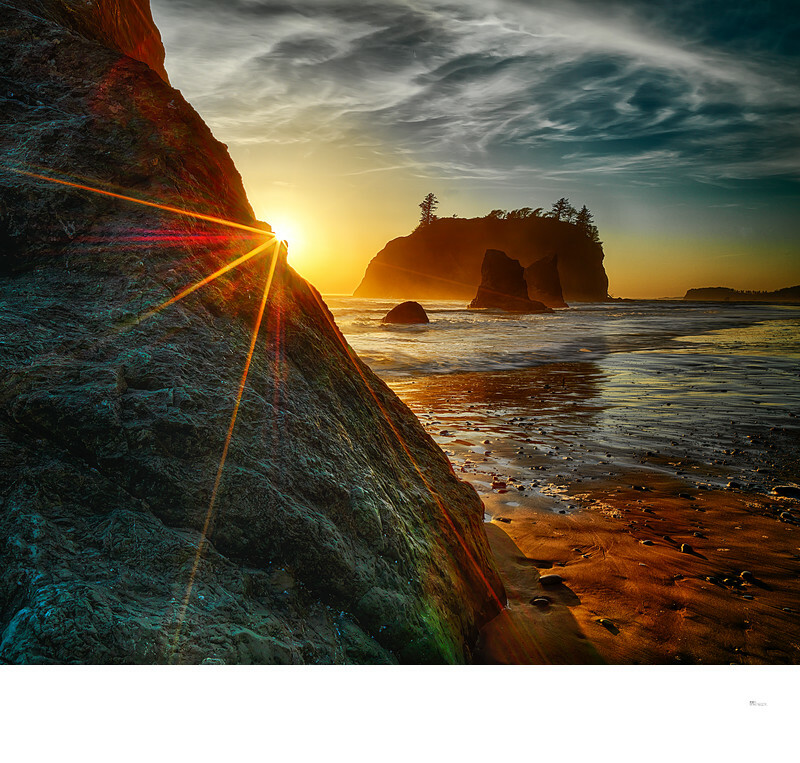 The mounted canvas print is also coated with a UV protectant to guard against fingerprint damage and UV rays. The canvas print arrives to you ready to hang, with hanging hardware already installed on the back. Therefore, you save money on the cost of framing, or handling very large, delicate glass. For large pieces, they are also lighter weight than a framed piece with glass. Images destined for canvas are processed so they are "Gallery Wrapped" around the edges. A portion of the photograph appears on all edges of the piece, with the full composition on front, creating a clean, simple look. Each is mounted to a 1.5 or 2 inch thick frame for dramatic depth. The back of each canvas has a description sheet giving some history about the photograph, my thoughts in creating it, and some technical details. Ink and paper alone can't create a print. As mentioned above, we invested a substantial amount into new printing technology to create the quality of prints we are producing. The printers we use are the Epson Stylus Pro 9900 wide format printer and the Epson Stylus Pro 4900 large format printer. These printers, along with the ink set already discussed along with fine art papers make a complete Fine Art printing system. It's Epson's most advanced printing system to date. The 4900 allows us to produce prints up to 17" wide and virtually any length and the 9900 prints up to 44" wide at any length. This allows us to make prints virtually any size and still maintain fine art quality. These recent investments are leading edge and provide unmatched quality and print longevity, previously out of reach to the modern photographer. All of our prints are available three ways. The print itself, the print with mat, or (matted and) framed. Regardless, all prints are mounted on archival quality mat or foam board. We do all our own framing including cutting and joining. For special projects, some of our molding is handmade. This method greatly enhances the depth of color, contrast and saturation creating a finely crafted masterpiece. Face mounting is when the front of the print is bonded to the reverse of a high gloss acrylic sheet. This preserves the Total size of the print and raises the bar for extraordinary image quality, with a vibrant clarity of colors, deeper darker black tones and a luscious depth of contrast. This, without a doubt, creates the ultimate viewing experience. The finest way to truly Experience the Beauty of any Kates Nature Photography Fine Art Prints. Contact us for pricing and details. The Limited Edition Fine Art Print is professionally mounted face-first onto 1/8" Acrylic-Glass (Both Reflective and Fine Art grade non-reflective are available) and backed by a 1/4" black dibond/sintra. An Aluminum inset-hanging frame is then attached to the back with a U hanging system. The final result is simply awesome, appearing like a high gloss, high saturation HD image floating on the wall. Identical to the "Ready to Hang" but backed by a 1/8" black dibond/sintra and NO Aluminum inset-hanging frame. This version requires professional framing/matting. Having a face mounted image carefully matted and framed results in the Ultimate Piece of Art that will definitely be the center of attention in any house, office or gallery. Cameras take pictures in certain "aspect ratios." For example, most cameras take pictures with an aspect ratio of 2 x 3. Which means you can print a picture from this camera that measures 2" x 3", 4" x 6", 8" x 12", 16" x 24" etc. . . . Much of our artwork is created using high resolution medium format cameras which have an aspect ratio of 4.5 x 6. Unfortunately, these sizes don't always fit the standard frame sizes of 5 x 7, 8 x 10, 11 x 14 and so on. The alternatives are (B) to crop the picture to fit the standard frame size (in which case you will lose some of the picture), (C) mat the odd size picture with a mat of standard measurements (in which case you can put it in a standard size frame), or (D) leave the original crop and have it custom matted and/or framed. As a photographer/artist, we often crop our artwork to non-standard sizes for artistic reasons because it can give us a more dramatic photo. Thus, my least favorite alternative is to then crop the image to fit in a standard size frame. Rather, our preference is to do custom matting/framing on the original crop, or mat it to a standard size. We are capable of providing you with either alternative and can discuss these alternatives with you when you order your artwork. We can also offer you just the print and you can provide your own matting/framing. 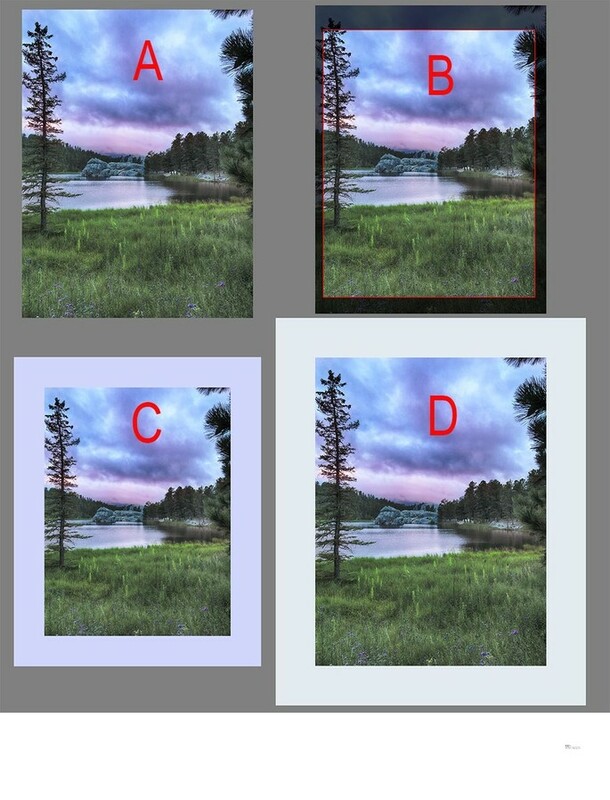 For example: Image A represents the original artwork; Image B is the original cropped to a standard 8 x 10 (the dark outside area represents the part of he artwork that is cropped out; Image C represents the original matted to an 8 x 10; Image D represents the original artwork matted with a 3" mat. Image D gives the best representation of the original art work.